Want to know what it's all about? 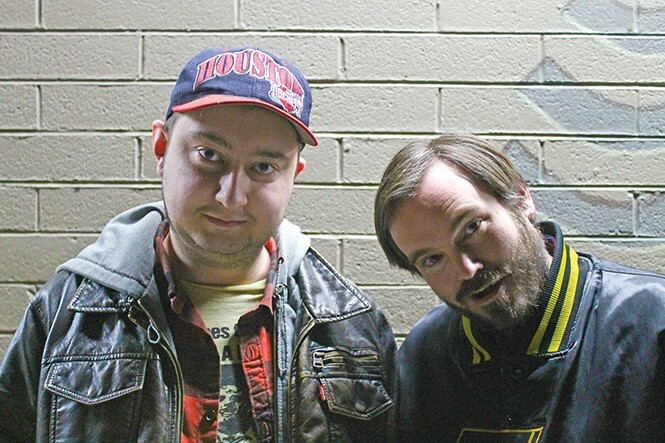 Utah native Jason Harvey (right) is the mind behind Free Kittens—a free, regular stand-up comedy show that has been packing in crowds as of late. Want to know what it's all about? The series' next feline incarnation takes over Urban Lounge on Feb. 2. I wanted to not have just a typical stand-up show. I wanted to have improv elements in it; I wanted sketch elements. I kinda wanted to take all the things I love about comedy, and put it in there and I love stand-up a lot. So, I'm glad that I have some amazing comedian friends, actually. That's kind of what Free Kittens is to me—it's just taking all of those elements and throwing them in and mixing it up. How did your co-host Greg Orme [pictured left] change Free Kittens' style? Before Greg came, there was very little in-between stuff. It was pretty much: bring the comics up, [and] they would draw a card or two. And then they'd take those suggestions and try to run them in the set, but I wanted it to be bigger. Since then, we've just kind of taken each show and tried to write and make it better, bigger, just unpredictable. It's not just a normal comedy show. How has the stand-up scene responded to the show? With Free Kittens, honestly, people have been pretty good; the crowd there is really awesome. It seems like there's always a different crowd. The comedy scene loves it. We had over 80 people at the last show. It was awesome. In this stay-at-home culture, how do you manage to get people coming back?